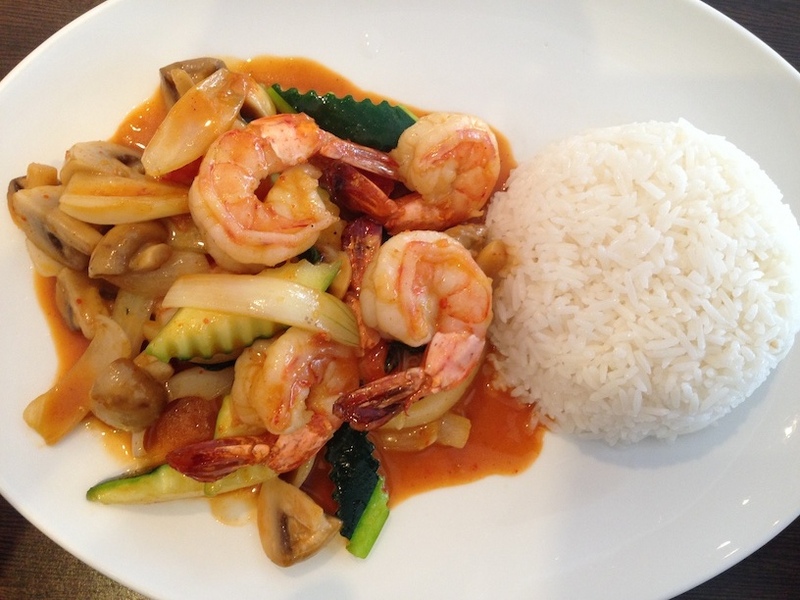 This is a Vietnamese dish described in the menu as "Scampi with Coconut/Chili Sauce". Can anyone tell me what ingredients I would need to make this sauce at home? I enclose two different variants from two related restaurants, where the sauce varies slightly. The one above which is thicker tastes better. 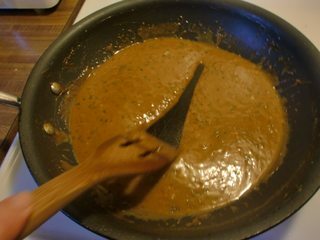 OK, I made my version of the sauce twice, I learned a little bit from my first attempt, so I'm going to walk you through my second. 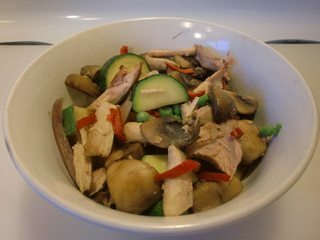 Although the ingredients in the stir-fry are vastly different (I had some left over chicken and I have a thing for frozen peas), I think the ingredients and technique I'm demonstrating here will work fine for you as far as copying the sauce. 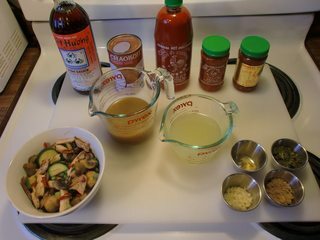 In the technique, I borrowed heavily from the traditions of other cultures, but the ingredients are all Vietnamese staples. Notice what you don't see here? There is no soy sauce here. The Vietnamese do not use a lot of what westerners think of as soy sauce. In Vietnam, Chinese-style soy sauce is called xì dầu (derived from the Cantonese name 豉油) or nước tương. The term "soy sauce" could also imply other condiments and soy bean paste with thick consistency known as tương. Both are used mostly as a seasoning or dipping sauce for a number of dishes. Vietnamese cuisine itself favors fish sauce in cooking but nước tương has a clear presence in vegetarian cooking. 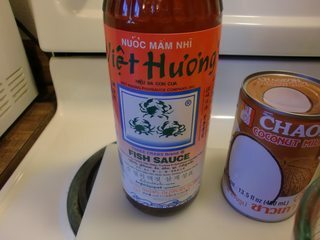 This is a very highly regarded brand of Vietnamese style fish sauce (nuoc mam). Even though it is made in Hong Kong, it is authentically Vietnamese and easily found in the US. It's commonly referred to as Three Crabs. It is the preferred brand of one of my favorite food bloggers, the one who taught me everything I know about Vietnamese cuisine, so I'll take her advice and I do very much like the sauce. I highly recommend this brand. It won the America's Test Kitchen tasting of coconut milk, and it separates readily. That will become important later. 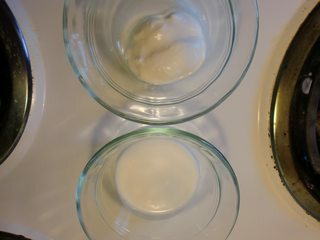 Whatever brand you choose be sure that it contains no added emulsifiers, and that it is a full-fat (not light) version. These are all the same brand. They're made in the US in the Vietnamese way; the founder of the company got his start in Vietnam selling hot sauces. This brand is ubiquitous in the US. The sriracha can be added at the end if you think the sauce still needs more punch. 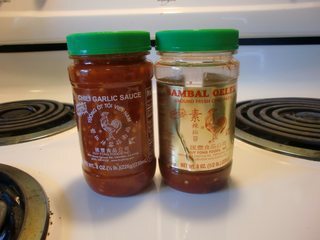 The chili sauce and the Sambal Oelek are identical products except that the Sambal Oelek does not contain garlic, the chili sauce does. So choose one or the other. 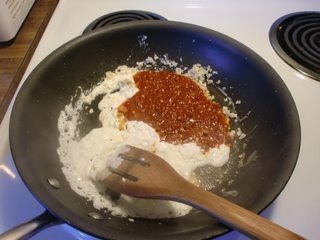 I used Sambal Oelek simply because I have a lot of garlic that needs to be used. The broth in the lower right is just low sodium chicken broth I kept at the ready in case I felt that the sauce needed to be thinned. I didn't use it, but I did mix it with the sauce I had left over to make a soup for another day. The other broth is a flavor bomb! This particular one has a chicken broth base. If you're making the recipe with shrimp, making the broth is a good way to use use the shells. You could also add some clam juice or even bonito flakes (yes, wrong culture) to amp up the seafood flavor. 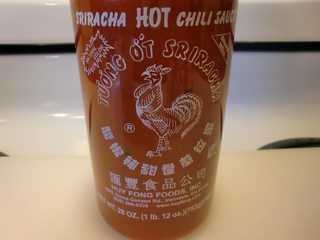 A key to the success of this sauce is that this broth should be very potent, and deliciously addictive on it's own. 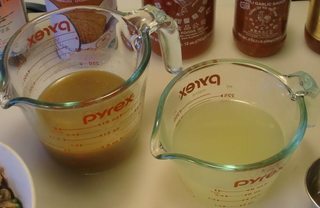 I started with 2 cups of low sodium chicken broth (use seafood broth if making it with shrimp), threw in the bones from the leftover chicken I used, a golf ball sized piece of ginger (roughly chopped), the zest of an entire lemon, a couple of cloves of garlic, and a healthy shot of fish sauce. If I had been able to get lemongrass and/or kaffir lime leaf, this is where I would have used them (and I would have skipped the lemon zest). I reduced the broth down to half the original volume, and strained. Even though I used ginger, fish sauce and garlic later in the recipe, I used them here too because these ingredients are all subtly different after long cooking. It's a fancy-pants flavor layering thing. Whatever floats your boat will work here; get the ingredients just to your preferred level of doneness. 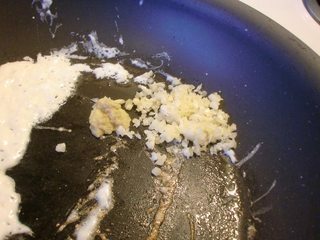 Since mushrooms are such flavor sponges I sauteed some garlic and ginger before I started them, and stir fried them with little slices of red jalapeno (that's the red in the picture). Since I prefer mushrooms fairly well-done, I sauteed for a while before I added onions. The onions went for a while, then the zucchini and leftover chicken only briefly. I only added the thawed peas after taking the pan off the heat. The whole thing will be just heated through in the sauce when it's done. Cilantro (this is just how I keep cilantro in my fridge, I make an all-purpose condiment when I bring it home fresh. Missing I wish I could have gotten my hands on some Thai Basil. I would have chiffonaded 3 or 4 leaves and added them with the cilantro. This is actually a technique seen often in Thai curries. 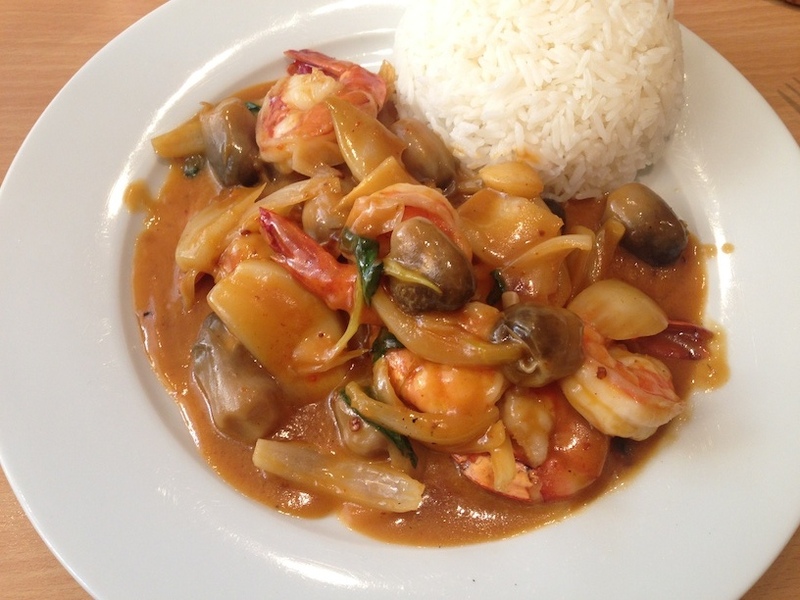 I don't know if it's seen often in Vietnamese cuisine, but it makes for a thicker sauce which I know you want. 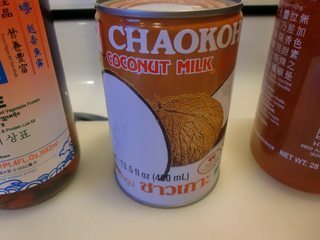 Hopefully you've allowed your coconut milk to stand undisturbed in the can for at least several days, it contains no emulsifiers, and it is a full-fat (not light) variety. If so, when you open the can, the top portion of the milk should be significantly thicker than the bottom. It's very much like how dairy milk separates if it hasn't been homogenized. Like dairy milk, the fat rises to the top. That's what we're taking advantage of here. 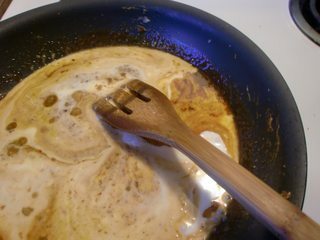 Scoop out the thick "cream" (the top third or so of the can) and put it in your skillet, cook over medium heat, stirring occasionally until you start to see the oil separate out. That's pure coconut oil. It may take several minutes for the oil to separate out. 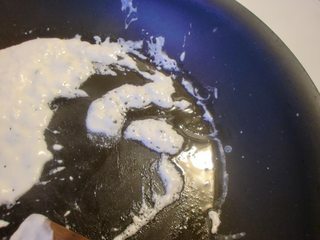 If it just looks like it isn't going to happen, add a teaspoon of neutral oil (or better yet, coconut oil) to the pan and pretend that it worked. 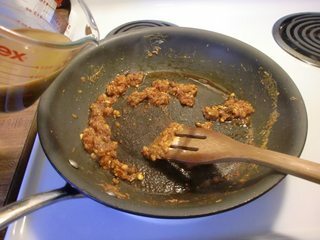 Saute your garlic, ginger, and chile paste or Sambal Oelek in that oil. That's half the jar of Sambal Oelek, BTW. This is not for the weak of heart. In goes the brown sugar. 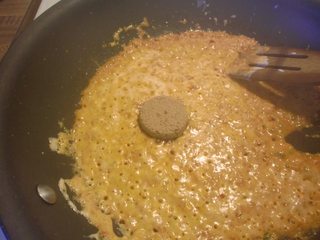 Cook it down over medium heat, stirring frequently, until you're left with an almost dry, thick paste. Add your rich broth and the rest of the can of coconut milk. Simmer that (stirring frequently) until it is as thick as you want. Taste for fish sauce, add as much more as you care too. Add your stir-fry and fresh herbs and heat through. Taste for seasonings, I added sriracha. Now you're ready to plate. EDIT: It bugged me that my sauce looked chunkier and less silky than the one in your picture, so the next day I strained the leftover sauce that had a little extra broth. That required just a bit of thickening with a cornstarch slurry to be thick enough, but now it looks just right. Both versions of the sauce are equally delicious. If you make this with shrimp, I recommend that you don't stir-fry it. Velvet it instead. Velveting is discussed here: How does velveting work? 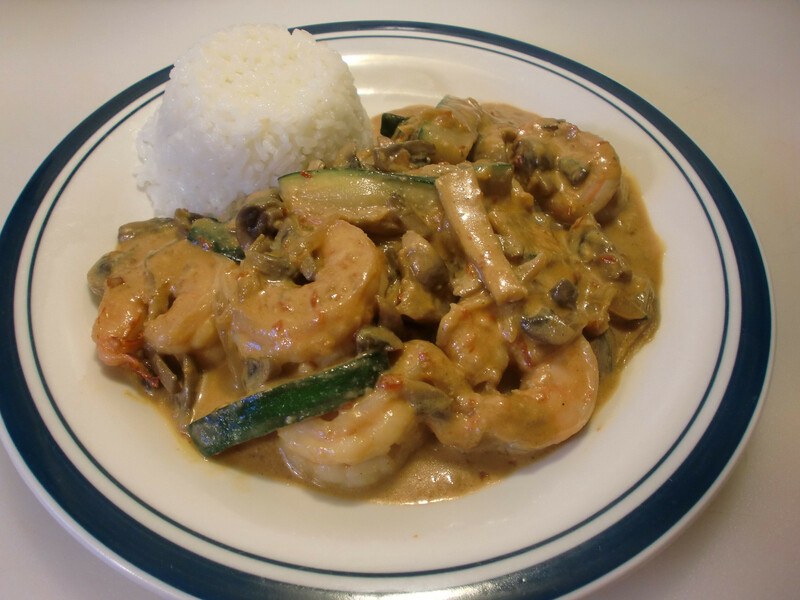 and it makes for a lovely piece of tender, flavorful shrimp, perfect for this recipe. This shrimp has been velveted. If you treat slices of chicken breast the same way, you can see a hint of a batter. You can't see that with shrimp, but the technique still "works". 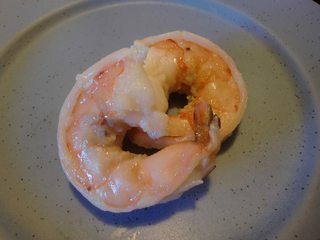 If you follow the instructions in the link provided on that question, the shrimp will end up just shy of perfectly done, so they'll be perfect after being heated in the sauce. As a matter of fact, I would recommend velveting any meat that you might use in this sauce. Velveting is a Chinese technique, but I won't tell anyone if you don't. 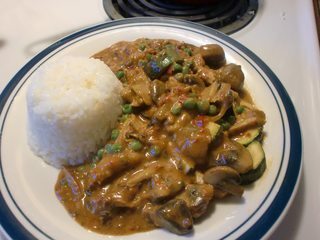 Lastly, the formed mound of rice on the side is definitely the way to plate this instead of with the stir-fry over rice. There was something very nice about getting a bite with some just pure white rice and some stir-fry with sauce. That's it. Let me know how it goes. Not the answer you're looking for? 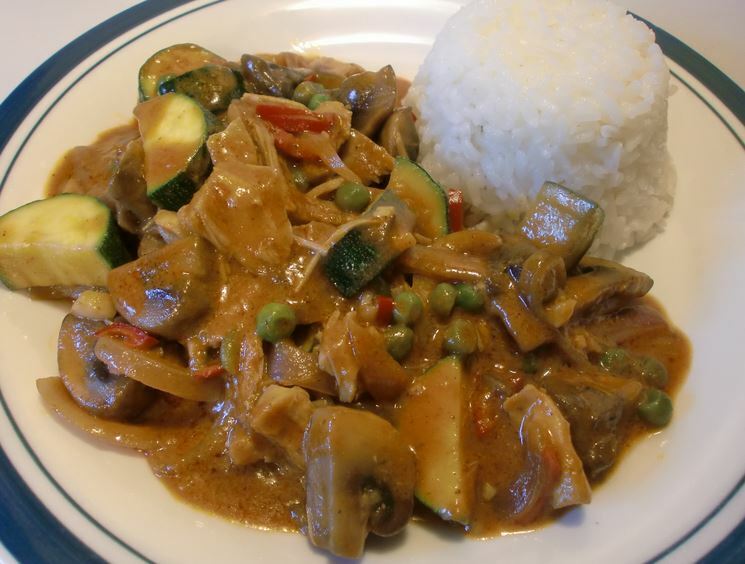 Browse other questions tagged sauce restaurant-mimicry vietnamese-cuisine or ask your own question. 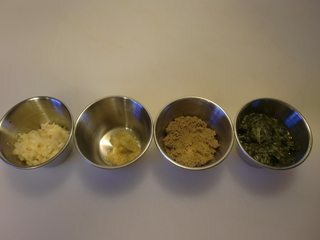 How can I word “add bread crumbs until it feels right”? How to make this shawarma hot sauce?